Pictured on Bunowen Pier following the Paud Kennelly Memorial swim were; (back row) safety officer Pat Conneely, event organiser Joe Kennelly, and top three finishers, John O'Sullivan, Fergal Madden, and Mark Dwyer. Front row; Trisha Sullivan, Eoin O'Malley, Lily O'Brien, school principal Marian McDermott, and daughter of Paud Kennelly, Alice Kennelly. 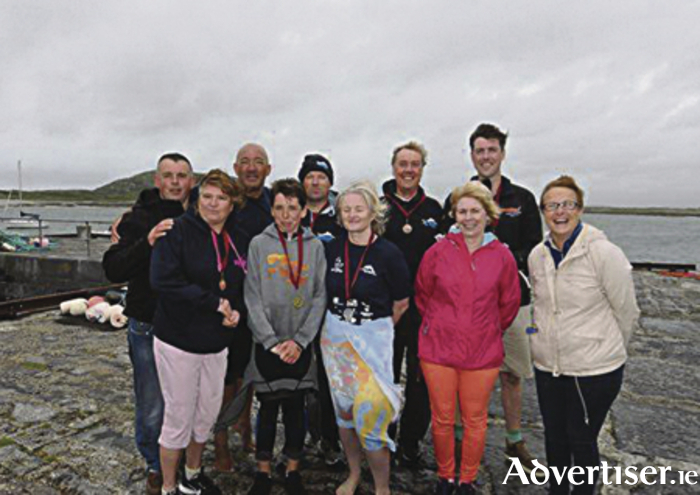 A handful of brave swimmers took to the choppy waters in Bunowen Pier, Ballyconneely, last weekend to raise funds for a local primary school. Twenty-five brave water enthusiasts dived head first into the bay on Sunday due to “a window of opportunity” presenting itself in the swimming calendar. The 4km swim was organised by members of the Kennelly family, Aillebrack, in recognition of the strong link between the family and the local national school, St Cailins. Three generations of Kennelly have taught in the school, and the swim represented a fitting tribute to the memory of former principal Paud Kennelly. The event was organised by Joe Kennelly who described the weather conditions as dreadful, but admitted that some swimmers were not willing to surrender. A sum of €750 was awarded to the school principal Mrs Marian McDermott, and Joe believed it would go a long way. “It is only a small, little, primary school, so it was just a donation, but it will benefit the pupils to no end,” he added. John O’Sullivan from Ennis, Clare, was first to cross the finish line, before being presented with the Paud Kennelly Memorial Cup by Paud’s daughter Alice. Athenry’s Fergal Madden placed second, and Kinvara’s Mark Dwyer claimed the third spot. “Next year, the event will be advertised,” said Joe, “and it will become a part of the annual swimming circuit”, which will place it alongside events such as the Frances Thornton Memorial Galway Bay Swim, Dublin city’s Liffey Swim, among others dotted around the Irish coast. Medals were also presented to swimmers Eoin O’Malley, Lily O’Brien, and Trisha Sullivan, who completed a 2km circuit. Dr Peter Meagher from Dublin brought proceedings to a close last Sunday evening with an acrobatic display of kite surfing around the bay.